Well, this is all very exciting isn't it? After years of waiting, Elle finally became a CARB, a Cuthroat Australian in a Relationship with a Billionaire. If you really want to make it, it's about marrying a billionaire. Australians are particularly good at this, per head of population, but Elle deserves one most of all. She gave that Arkie not one, but two, billionaire heirs, and did he marry her? Nup. The only man in the world who wouldn't marry Elle McPherson. But marrying Uma Thurman is OK? You can read some of this mess here. One wonders what the women's mag editors must think when Holly Valance can claim one, Portia de Rossi got the good one, but the Body got nothing. Their advice got us no where. Now, however we can relax. Last weekend, Elle from Cronulla, (we haven't seen much of Mimi for heaps, have we?) married a 'real estate developer' in Fiji. Not very billioinaireish if you ask me, doesn't he has 'real estate' in the Maldives? Good on ya, Elle. This is Australian of the Year worthy stuff. It's the female equivalent of bringing home the Ashes and you, Ma'am, deserve a ticket-tape parade. An Introduction to CARBs or How the hell did Holly Vallance do that? Australians are incredible achievers. While we have a reputation as a bunch of hooligans who surf all day while drinking beer, there's the other ones who compete on a global level and tear strips off their competitors. And we love a prize to show Mum. We refuse to leave the Olympics unless there's a medal for every six people in the population. We see breakthroughs in science that change history. There's always an Aussie lurking in the hallways of excellence in any given competition, some freak Julian Assange ready to take home the trophy. But my favourite local champs are the CARCs especially the CARBs that Holly Valance has now sealed. Australians have an eerie way of nabbing a high profile celebrity and piggy backing that star all around the universe. Cutthroat Australians in Relationships with Celebrities, or CARCs are nothing new. But Holly Valance has just won gold again for the nation by becoming one of our newest Cuthroat Australians in Relationships with Billionaires, or CARBs, by marrying property developer Greek Nick Candy this weekend. Holly Candy. Paris Hilton is filling in visa forms to immigrate as we speak. Most of you won't remember who Holly Valance is/was and that's for the best where your brain's concerned. She stood around on Neighbours for a while, and did some Melissa Tzkautz type singing and then, she went to court with her manager which is the standard Aussie starlet tale. We all know what Nicole Kidman did to get famous. 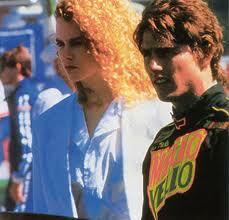 I saw that Days of Thunder and she was no neurologist. She is our best CARC to date. She did whatever it took to make her career happen, smiling her sweet psychotic smirk everywhere she went with Tom Cruise. After that, every little girl from Perth to Port Macquarie wanted to be a CARC when they grew up. So great. Peter Andre married the overpriced Jordan, which was probably like being at one of Molly Meldurm's afterparties anyway. Naomi Watts was just in a cutthroat relationship with Kidman for the fifteen years. Worked like a charm. CARCs are like pitbulls only meaner. Portia de Rossi aka Mandy from Melbourne dumped Ringo Starr's stepdaughter Francesca to homewreck Ellen's life and got herself married off real nice. She took the easiest path by ignoring all the men and targeting a power lesbian. Extra cutthroat. GO AUSSIE. Then model-for-five-seconds and political granddaughter Krissy Hinze did Ok with the Netscape guy. They have a nice boat and a nice baby now. She was our reigning CARB until now. Poor failed CARC Sophie Monk, so close to Nicole Richie and now so far, she ordered triple her collagen from her boyfriend plastic surgeon that week. If you don't know who Holly Valance is, think soap opera extra but without the talent. Precisely. Clearly though, she's billionaire wife material, above all others on earth. What makes our stock the winners of such awards? Cos if I was a billionaire looking for a wife, the channel 10 unemployment line isn't where I'd start...what is it Our Holly does so well?